Visitors to Times Square Enjoy Hotel's Central LocationBoasting an ideal location and cool design, the Staybridge Suites Times Square - New York City hotel is a sleek, modern extended-stay hotel that's perfect for all travelers visiting Manhattan. This hotel's studio suites are within walking distance to the best that Midtown has to offer.Leisure travelers enjoy being so close to Times Square, and Broadway theatres, Restaurant Row and Bryant Park are just a few blocks away! Take in the grandeur of New York City from the hotel's central location and see it all as you walk everywhere, even to the Empire State Building.If you're on business in Manhattan, the hotel's location is ideal as we are within walking distance to many Fortune 500 companies. As one of the closest hotels, it's an easy walk to the Jacob Javits Convention Center.After you've explored New York City, the hotel's studio suites, featuring pillowtop mattresses, welcome you to a restful night in the midst of this vibrant city. Take advantage of the complimentary evening receptions and stay on top of your exercise routine with a 24-hour Fitness Center that features Cybex equipment with personal TVs. You can stay connected with the free high-speed, wireless Internet access throughout the entire hotel. 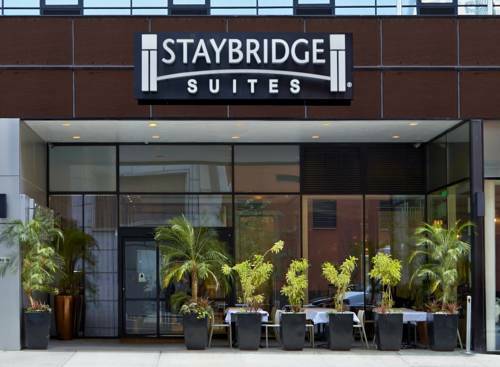 Book yourself an extended stay or a single night at the Staybridge Suites Times Square - New York City hotel and enjoy the comforts of home as our guest. The Den, Staybridge Suites Times Square's hotel bar, serves speciality cocktails in a warm yet modern setting featuring a water fall and contemporary music. Hell's Kitchens answer to Cheers! Multi purpose facility that can accommodate from 2 to 100 peeople. Statue Of Liberty can be accessed via Ferry or viewed from one of the many river cruises available within walking distance of the hotel. Museum located at the intersecton of the Hudson River and East River. The Island is a short boat ride from lower Manhattan. Staybridge Suites Times Square New York City is a two minute walk to the heart of Times Square. UN is located on the eastside. Cross town taxi can take up to 20 minutes, walking distance 25 minutes, or subway to Grand Central with access on 40th and 8th Avenue. Hop on the subway with entrance on 40th and 8th avenue and you can get to Wall Street 15 minutes. Straight shot, easy commute. Located between 47 and 50 the Street on the Avenue of the Amercias. Less than 15 minute walk from the hotel. Home of many concerts and events including the Holiday Show and the Rockettes. Main entrance is on 7th Avenue.. Home of the New York Knicks, Lady Liberty and New York Rangers. Also feautures theatres for full scale production. Schedule and hours vary, please refer to the Madison Square Garden Website for shows, games and times.